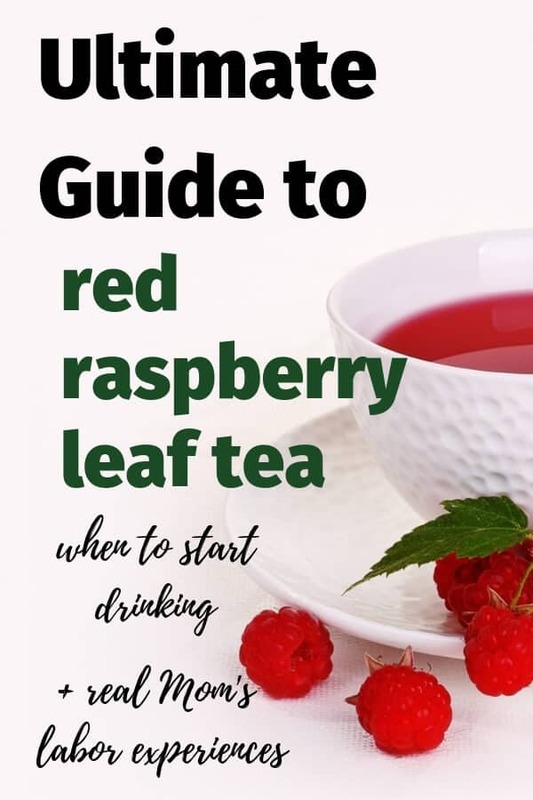 Are you wondering if you should try red raspberry leaf tea? Maybe you have heard stories of Moms who used red raspberry leaf tea during pregnancy and had really fast labors. And you are wondering – does red raspberry leaf really induce labor? Or are you trying to avoid an induction and wondering if this tea could help you go into labor? 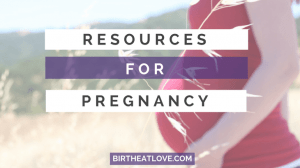 Are you looking for natural ways to induce labor? Drinking Raspberry leaf tea has so many benefits during pregnancy. It has traditionally been recommended by midwives to provide essential nutrients and help tone the uterus. But there are many Moms who use an extra strength raspberry leaf tea infusion, or “labor tea” to help bring on labor. So should you give red raspberry leaf a try? 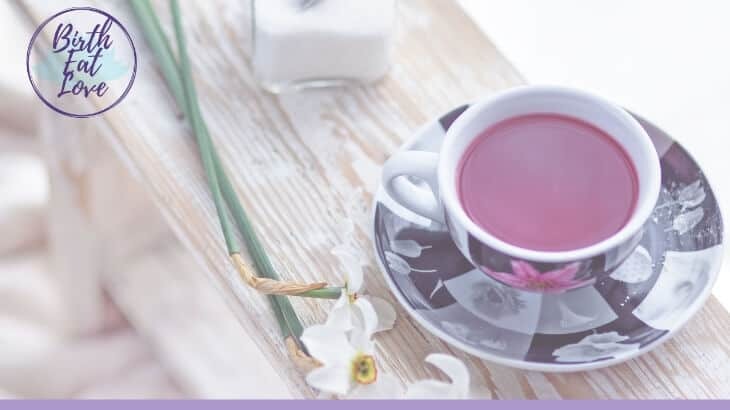 This article will share some of the benefits of drinking the tea, as well as some real Moms’ experiences with drinking raspberry leaf during pregnancy so that you can decide what’s right for you. This amazing herb has been used since the sixth century to aid women during the childbearing years. It is known for it’s ability to tone the muscles of the pelvic region, including the uterus. Red raspberry leaf is rich in many vitamins and minerals that are important for both Mom’s and baby’s health during pregnancy. Source: Wise Woman Herbal for the Childbearing Year (pg 18-19) Find the book on Amazon here. Some of the reported benefits of drinking red raspberry leaf during pregnancy include easing morning sickness, reducing pain during labor and after birth, and encouraging more effective contractions which can make for an easier and shorter birth process. When should you start drinking raspberry leaf tea? There are lots of differing opinions on when to start drinking this tea to get the full benefits. There is some anecdotal evidence that drinking RRL in the first trimester can cause miscarriage. So if you have a history of miscarriage, or are concerned, wait until after the first trimester to start. However, many Mamas find that drinking RRL can help with the nausea of early pregnancy and help balance hormones. Drinking a pregnancy tea blend may be a good option, as it contains less RRL than straight RRL by itself. Discuss with your care provider if drinking in the first trimester is a good option for you. This is a good list of teas that are generally considered safe to drink during pregnancy. The general consensus seems to be that it is safe to start drinking red raspberry leaf in the 2nd trimester. Start with 1 cup and increase up to 3 cups a day in the 3rd trimester. Just make sure that you are drinking red raspberry leaf, not raspberry flavored tea. They are not the same. It’s a good idea to buy loose red raspberry leaf in bulk, because you will be going through a lot of it if you drink 2-3 cups per day. Plus you can drink it postpartum and in between pregnancies. If you prefer tea bags, this is a high quality brand. What does the research say about drinking red raspberry leaf while pregnant? There have been only a few studies on red raspberry leaf and only a handful done on humans. This video by Evidence Based Birth gives a great overview of all the research and the conclusions. Can raspberry leaf help you have an easier labor? There are lots of Moms that feel that drinking red raspberry leaf helped them have an easier labor. In this video Mama Natural, Genevieve Howland, describes how she felt it helped her (starting at the 3 minute mark). Genevieve has an AMAZINGLY in depth online birth course that helps Moms prepare for having a natural birth. If you are wanting a natural birth and still feeling unsure or nervous, this course will give you the foundation and confidence you need to make it happen. Learn more about the Mama Natural Birth Course here. “I drank red raspberry leaf tea daily during my 4th pregnancy. Not only did I hear great things about it online, but also from my midwife and my doula community. As a birth doula myself, I wanted to do everything I could to increase my chances of a smooth and easy childbirth. Did it work? Well, my 4th birth went SO smoothly and much quicker (6 hours instead of 15) than my other births. Yet, I also used Hypnobabies and had a home birth, rather than a hospital birth with my first 3. I also had regular chiropractic adjustments and practiced Spinning Babies techniques with my 4th. “I started drinking red raspberry leaf tea from 30 weeks in my first pregnancy. I planned a birth centre birth and heard nothing but positive feedback in assisting you with an easier labour. In my own experience I believe it gave me the ability to dilate at a bearable rate. This meant that I was already 4cm dilated before I even phoned the hospital. I laboured 10 hours at home and 7 hours in hospital. I feel drinking the raspberry leaf tea each day from 30 weeks prepared my body for the big day. “I began drinking RRL when I was pregnant with my first and still drink it. I did have extremely early Braxton Hicks. I went through about 5-7 lbs of dried leaf each of my 3 pregnancies. I actually made it as an infusion, not tea (steeping overnight). “I drank it all through pregnancy, and at various times for general good uterine health. It did not induce labour, nor did it make labour shorter. With my eldest, I’d been drinking it daily for years leading up to birth, and labour was 23 hours long. I drank one or two cups a week in my last pregnancy and had to be induced, and eventually have a c-section after 12 hours of labouring with pitocin (due to fetal stress/heart decellerations and lack of progress). “I started drinking raspberry leaf tea at around 35 weeks. I had pregnancy hypertension (not the same as preeclampsia) so I was hesitant to start drinking it too early. After the ok by my OB/GYN, I started drinking one cup a day in the evenings. At week 37 I was dilated 1 cm. I was told my son might be sooner than the due date, a he was measuring 7.5 lbs already and getting in the right position. My OB/GYN ok’d any activity to help with further dilation. So I became drinking the red leaf tea 2x a day, once in the morning and again at night. By week 38 check up I was measuring 3cm! I ended up having to be induced at 39 weeks due to my blood pressure and baby’s size. As far as the tea, I do believe it helped me somewhat with dilation, BUT I did not have a shorter or easier labor. I personally drank red raspberry leaf during my 4 pregnancies and am drinking it regularly now during my 5th. I also drank it during postpartum to help reduce after birth pains and in between pregnancies to help with period pains and PMS. 1st pregnancy – I drank a pregnancy tea blend that contained red raspberry leaf starting in the 2nd trimester. I drank it pretty regularly and increased to 2-3 cups per day in the 3rd trimester. Near the end I switched to straight red raspberry leaf tea about 3 times a day. Results – 3 days before my due date at my checkup, I was dilated 3 cm and didn’t even feel a thing. I delivered a healthy baby on her due date. Labor in total was 10 hours. Baby came very quickly at the end, doctor was not even in the room! 2nd pregnancy – I did about the same as the first. At the start of the 3rd trimester, I switched to straight RRL over the pregnancy blend. I also started drinking nettle tea regularly, another good tea for pregnancy. Results – I was 2 weeks over due with my little one when I went into labor. It could be because the due date was miscalculated (something to keep in mind if you are overdue and under pressure to induce). My labor was about 8 hours. Once my water broke, the baby arrived 2 hours later with about 20 minutes of hard labor and pushing at the end. 3rd pregnancy – I started drinking RRL in the 1st trimester to help with morning sickness symptoms and it really helped. I drank it religiously, and occasionally as pregnancy tea blend, and gradually increased to 3 cups per day by the 3rd trimester. After reading about “labor tea,” I made a strong batch the night before I went into labor when I started feeling some contractions on and off. Read about how to make a labor tea here. Results – My labor lasted about 4 hours and was by far my easiest labor. My baby arrived very quickly and I say there was only a few minutes of intensity. This time, once my water broke, the baby arrived with in 10-15 minutes. 4th pregnancy – I did the same as with the 3rd. I made a labor tea on the morning I started to feel contractions that included RRL and nettle tea. Results – The labor was actually longer this time, lasting about 12 hours. It was fairly easy though being able to go about my normal day up until the last few hours. There was only about 1 hour of intense contractions. Once my water broke, the baby came within 10 minutes and I only pushed 3 times. Overall, I would recommend that you give raspberry leaf tea a try during pregnancy. For me personally I feel like it helped me have easier labors. I would generally say that my 3rd and 4th births were not as painful, something that may have to do with drinking the labor tea. Please remember though that every labor is different and there are MANY factors that go into how your labor goes and how long it lasts. Drinking this tea is just one helpful way you can improve your chances of having an easier labor. The information in this article is not intended as medical advice. Please consult your care provider when making decisions about your pregnancy. Wondering what else you can drink during pregnancy besides water and tea? Check out this list of super healthy pregnancy drinks. Want a natural childbirth? Here are some of tips that can help you get ready for natural birth. Getting prepared for postpartum is a MUST in the third trimester! Read this list of the natural postpartum essentials to stock up on now. Healthy Pregnancy birth prep, childbirth preparation, natural childbirth, pregnancy, pregnancy tips. permalink. I drank RRL nearly everyday for the entire pregnancy. I had a 36 hour labor. My cervix was very thin, but I never dilated passed 3cm. RRL tea did not give me a shorter labor. Thanks for sharing Regan! I find it interesting that it doesn’t seem to help everyone when I’ve had such a good experience with it. But it’s important to remember that there are so many factors that go into how your labor goes.